Pet supply retailing, having carved a niche, is ready to take off. Pet-supply retailing is a unique and innovative form of retailing. With increasing number of people indulging in the practice of keeping pets and considering them to be a part of their respective families, specialty retailers are vying to grab a share out of the pet supply market with personalised services and exotic products. Be it the toddlers, Generation Y (15-24 yrs old) or the Greying Tigers (60 yrs and older), all are fascinated by pets. 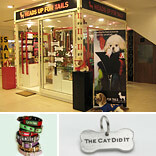 Retail outlets (including online retailers) like Heads Up For Tails, kennelmartonline.com, petsnpets.com and PAWS- the pet store among others are aiming to achieve exactly what is the demand of the time- appeal different generations. Both pet buyers and carers need special treatment and each group has different requirements which need to be addressed. That's the challenge to success in this unique retail category. Though the current retail scenario with regards to the pet industry is completely unorganised, but it has been witnessed that this trend is gradually changing. Nowadays, a lot of pet lovers are entering the scene with small pet stores and some great ideas on board. Rashi S Narang, Owner, Heads Up For Tails, opines, “A pet retail outlet offers pet food and pet accessories such as collars, leashes, grooming products, bowls, etc. In addition to the basics, an ideal store would be one that could also offer its customers related services such as pet grooming, pet walking, pet sitting and pet boarding. In India, pet stores are still very small and not professionally run.” Heads Up For Tails is located at, saket, while its merchandise is also available at Paws The Pet Store, Bangalore, Paws n Claws, Goa, It's A Dog's Life!, and Dawgz in Mumbai. Globally, it has been noticed that spending on pet products varies significantly with age, older householders form the category of the biggest spenders on pets. Married couples minus children at home tend to spend 30 per cent more than the average household on pets. The best customers of this unique industry (spending the most on pet products and services) are the married couples with adult children at home, spending around 45 per cent more than the average household on pets. The price range for pet products offered ranges from Rs 20 to Rs 18,000. While the range at Heads Up For Tails starts from Rs 20 and goes until Rs 5000, at kennelmartonline.com, the range is Rs 30 to Rs 18000 for the cages. The investment to open a pet supply retail outlet ranges between Rs 3 lakh to Rs 50 lakh on an average. Though the market has immense potential for growth, there exists a strong need to add more quality retail stores. Pet supply retailer are increasingly looking at increasing their margins and to modernise their retail concepts by offering a user friendly, fun and relaxing shopping experience while giving the best service available to prospective customers and their pets. Heads Up For Tails will soon have a big presence in Singapore in 2010 and is also planning to have three more outlets by 2010.